Are you giving preventive medications correctly? Pesky, icky, gross, or annoying might be words that come to mind when you consider fleas, ticks, heartworms, and intestinal parasites. You could even add the descriptors stealthy, persistent, disease causing, and zoonotic. We talk to pet owners all the time about the importance of preventive medications. We love it when pet owners ask questions and become engaged in conversations about the best strategies for their pet’s wellness care. Through these conversations, we do see some questions and topics that come up routinely. We have pulled together some highlights that we feel can help all pet owners understand the ins and outs of administering preventive medications correctly. As you read through the pointers, you can also reference these charts to help you understand some of the major things about some common preventive medications. This is by no means an exhaustive list, and you can refer to the individual product websites for additional details. • Don’t make the mistake of assuming one product can cover all of your pet’s needs. Read the packaging to completely understand which parasites the product protects against (or does not protect against). Our team can help make recommendations to make sure your pet is fully protected. • Keep up with your pet’s weight! The dosing for preventive products is based on your pet’s weight. If your pet gains or loses, then he or she could change weight categories for a product. As you can imagine, if the dose is not enough, your pet will not be fully protected. Conversely, if the dose is too high, then side effects may be more likely to occur. • Make sure you are administering the product at the frequency directed on the label. Many products are administered monthly, but some products are given less frequently. If the product is not dosed appropriately, then it is not able to protect the animal as expected. • Don’t discontinue preventive medications in colder months. 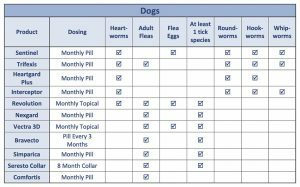 Although the seasons will impact how many parasites might be around, it’s impossible to predict the exact start and end to flea/tick/heartworm season. Lawndale Veterinary Hospital recommends year-round prevention against heartworms, fleas, ticks and intestinal parasites. 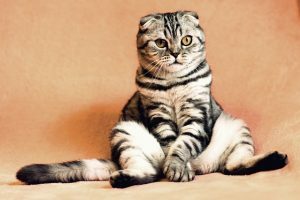 • If your pet vomits after taking an oral preventive medication, the medication may not have been in the stomach long enough to protect your pet. Your pet may or may not need to be re-dosed with the medication. It all depends on how soon after dosing the vomiting occurred. Contact our office so that our doctors can help you determine if further steps should be taken. • Cats are not small dogs. Don’t make the potentially deadly mistake of applying a dog’s topical medication to a cat. 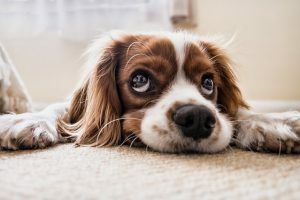 Furthermore, some topical flea and tick products for dogs recommend separating the dog from any cats in the house for a period of time after application. Check your product’s label to see if you have one of those products! • Flea infestations can take months to fully resolve. This is because immature flea stages can arrest development for a period of time. Then, when environmental conditions are right again, the flea continues to mature. Before assuming the flea control product is not working, make sure it is being used appropriately and at the frequency recommended on the label, and also make sure you are using a multi-modal flea control approach at home. • Apply topical products correctly. The location of application will be explained on the product box or in the package. The product needs to be applied to the skin. If it all gets in the fur or drips off, the product will not give the pet the necessary amount of protection. Using preventive products correctly will help your pet stay fully protected. In the long run, it can be less expensive to prevent a problem than to treat one. Finally, if you have trouble remembering when to give your pet’s prevention each month, then set reminders on your phone, or set up email reminders through the company that makes the product(s) you use.